Toyobo Co., Ltd. has supplied excellent fabric created by Toyobo's high technology to Japanese and overseas markets. We will continue to offer a wide range of materials to fulfill the customer's satisfaction. Please refer the articles below. You will find Toyobo's lineup of high quality fabrics. High grade broad cloth made from 100's and higher twist yarn using Egyptian cotton. These fabrics show beautiful shine and soft handfeel which are coming from the characteristic of high quality cotton. Please apply to a wide variety of garments from men's dress shirts to women's blouses. A superior blend of high quality Egyptian cotton and micro-fiber polyester. We are sure that its elegant shine and soft handfeel will satisfy the customer's requirement. We also can supply the functional fabrics for a comfortabel life such as anti shrink and anti wrinkle finishes. These are suitable especially for dress shirts. Some kinds of above cotton and cotton/polyester fabrics can be used for Vapor Phase Finishing (shape form) shirts. 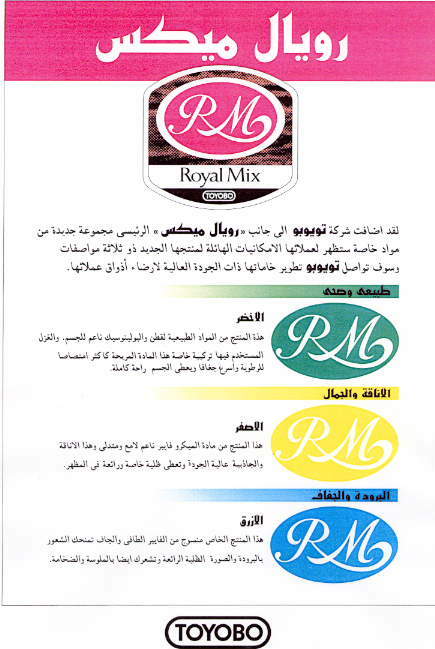 Royal Mix is our brandnew sereis made of the integrated yarn (polyester-staple, polyester filament, and natural fiber). The features are rich-drape, softness, comfortableness, and excellent appearance. LUQUIA is micro-polyester and tufcel (fine polynosic fiber) blended fabric. You can feel soft and cool touch. Super Rosanna-W is our most famous brand. We have been enjoying good reputation from our customers since long time. This is a mix-woven fabric made of Luquia-yarn and polyester filament. Lumiart is spun polyester fabric made of our original sinthetic fiber. It is very comfortable to wear like cotton. Noted: or TM is a registered trademark of Toyobo in Japan.